The vahana of Shiva, the vehicle of the great God, is a bull Nandin. Nandin in Sanskrit means "joyful" and this placid animal is also the most fervent devotee of Mahadeva. The bull symbolizes vigor, virtue, the moral rectitude and wisdom, but also the sexual instinct dominated by Shiva. 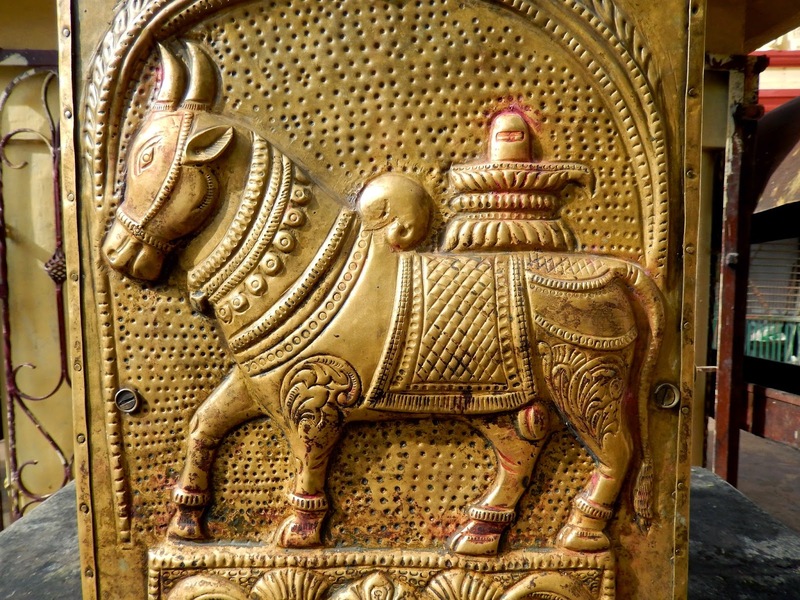 Along with the cow, the bull is considered a sacred animal in India, the bearer of good fortune and wisdom. Its imprint, nandipada, it is equally sacred and bearer of good fortune. Nandin is always guarding the door of Shiva and prevents jamming to distract Shiva from his occupation: meditating or loving with Parvati. In all the temples, in front of the room where is placed the image of Shiva, the Lingam, is always placed Nandin because it is disrespectful for a mere mortal to apply directly to the great God, the faithful whisper in bull's ear their requests. It will then be the bull in reference to their God. 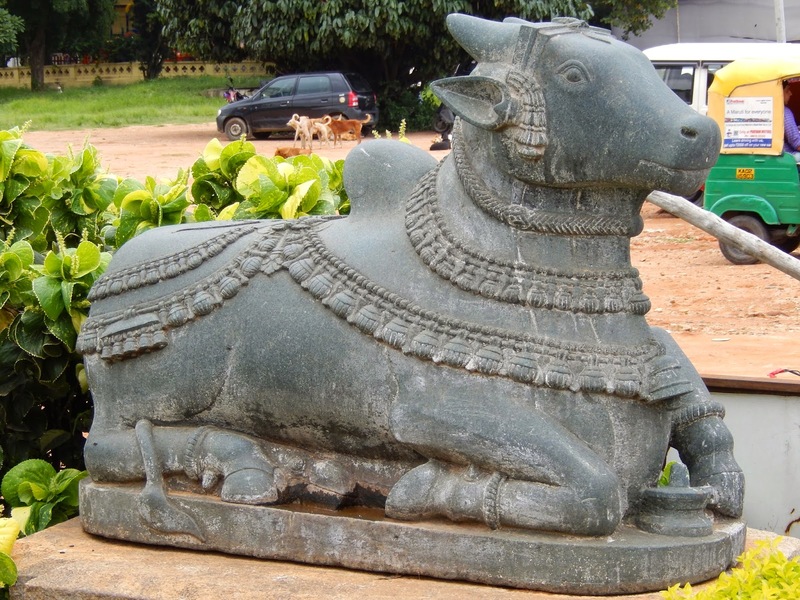 Especially in South India, the images and statues of the bull Nandin are widespread. 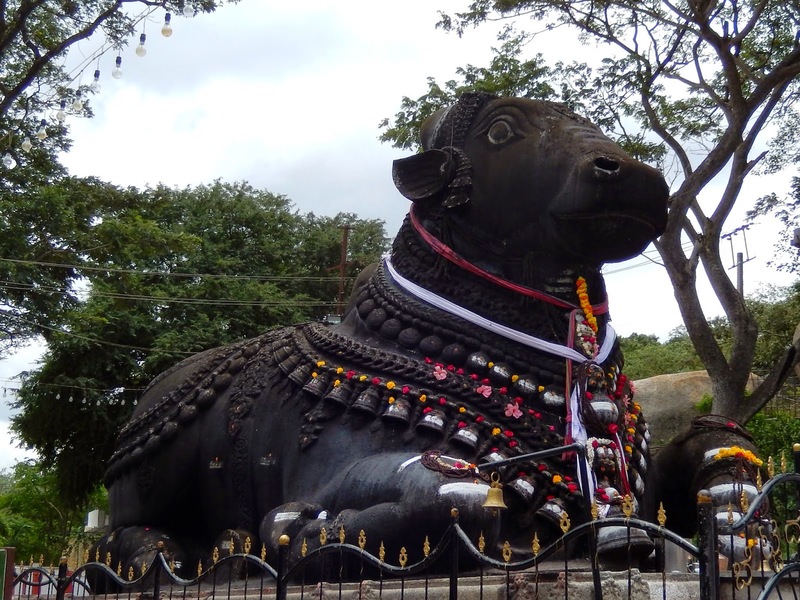 One of the biggest bull is Nandin in Mysore, city of Karnataka, where on the Chamundi Hill is a huge bull, five meters high, carved from a single block of stone in 1659 and depicted in the photo to the side. Another huge Nandi is before the wonderful Brihadishvara Temple, the Shiva temple of Thanjavur (or Tanjore). 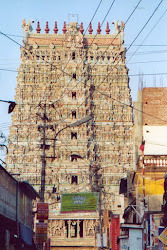 A six-meter long statue of granite that looks toward the main door of the temple. 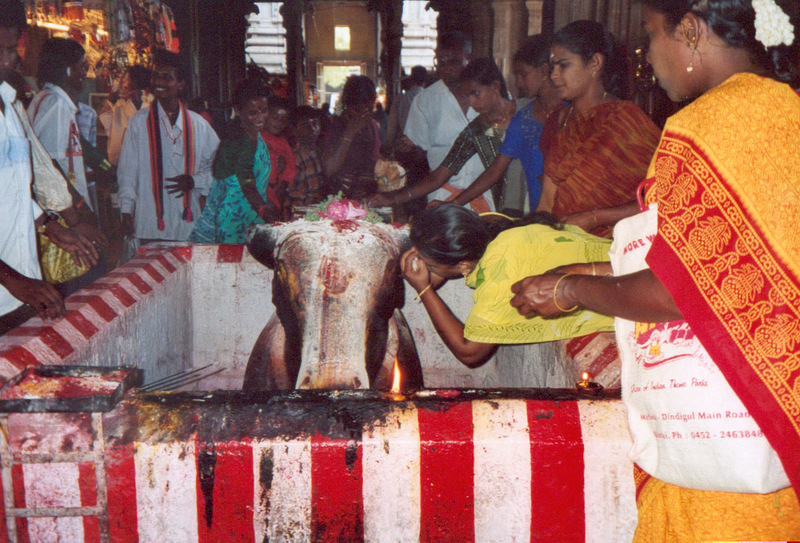 Faithful Shaiva in Temple of Goddess Meenakshi in Madurai whisper in the ear of Nandin their requests to God Shiva. Nandin has many epithets, including Tandavatalika when he plays and accompanies the dance of Shiva Nataraja and Nandikeshvara which means 'joy of the Lord'. In this bas-relief brass at the base of the flag of a Shaiva temple is depicted Nandin leading Shiva and Parvati represented by the Shivalingam.